Hannah licking her fingers to play that thing [I forgot what it was called. OTL] was a bit gross for me. She should've used something else to lubricate her fingers to allow her to play the instrument. Sebastian's performance on the glass cups which was wonderful. Demons all want and seek one thing and that is: a complete soul; one that has obtained revenge. 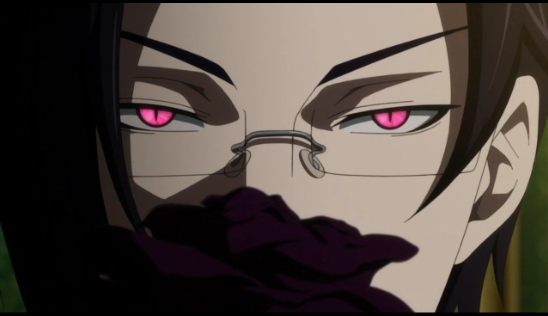 In order to get a complete Ciel Phantomhive, the two demons form a deal. The Trancy family is now set as Ciel’s enemies for revenge and after Ciel obtains his revenge, Ciel is to be handed over to Claude. Will Sebastian really hand Ciel over just like that? Or will Sebastian somehow break the contract? What happens when contracts are broken? Is there some sort of moral code or law among the demons? 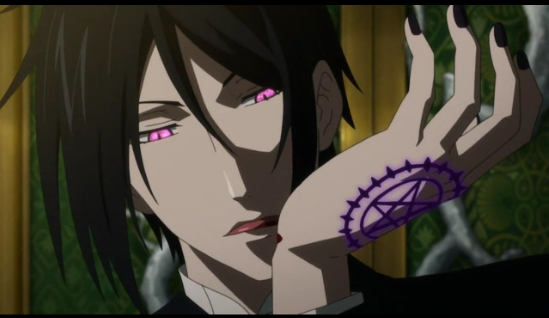 I find it fitting for Claude to draw his blood by cutting his wrist and Sebastian drew his blood by biting his wrist. This entry was posted in Anime, Finished, Kuroshitsuji II and tagged Alois Trancy, black butler, Ciel Phantomhive, Claude, Kuroshitsuji II, season two, Sebastian. Bookmark the permalink.